AuthorAID online courses continue to attract more and more researchers from around the world who are looking to develop their research writing skills. Our last course, which ran from 18th April to 12th June 2017, was our biggest course yet, attracting over three thousand participants from developing countries. 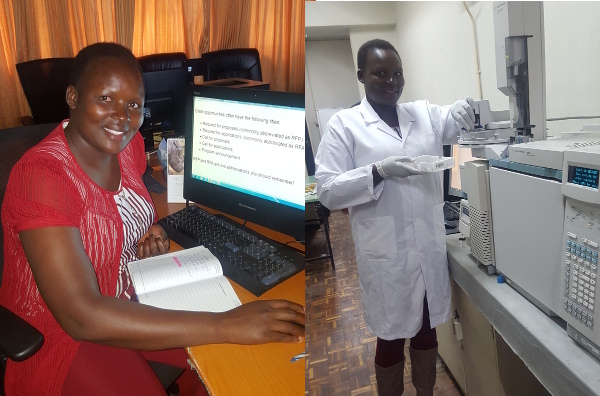 Course participant Caroline Koech from Kenya, shared pictures of her doing the online course, and conducting her research. This was the first time we have run the MOOC as an eight-week proposal writing and research writing course. The lessons covered literature review, research ethics, writing a grant proposal, writing a research paper, and publishing in a journal. The course consisted of 17 lessons, weekly quizzes, and three peer assessment activities (including writing exercises for a short grant proposal and research abstract). The participants had to pass all the quizzes to qualify for a completion certificate and digital badge. We welcomed participants from all over the world. Highly represented countries included Nigeria, Egypt, Ghana, India, Kenya, Nepal, Pakistan, Sri Lanka, and Sudan (including 30 women researchers who were participants of an OWSD/INASP workshop in Khartoum shortly before the course). It was also good to see some participants from as far afield as The Bahamas, Cambodia, Iraq, Kazakhstan and Yemen. In total we had our highest number of participants for an online course - 3273 people started the course and 1601 completed, a 48.9% completion rate. "The course was great. It was my first time to do an online course but I had no technical challenges in accessing the course. Even with the poor internet connectivity that I usually experience I was able to access the lessons. I have learnt a great deal in the course especially on how to increases chances of getting my paper published. I will definately transfer what I have learnt to my students." The course was run on the open source Moodle platform by two AuthorAID staff - Ravi Murugesan facilitated the course and Andy Nobes was administrator/moderator. They were supported by a team of 30 guest facilitators from the AuthorAID network, including AuthorAID mentors and trainers from our partner institutions in Africa and Asia. who also helped market the course. We were pleased to see women represent 66% of facilitators and 46% of course completers! "I like this course; very contemporary, need based and with direct applications. Excellent!" In total, we have run four AuthorAID MOOCs since October 2015, with 7454 participants starting the course and 3747 finishing, a completion rate of 50% (46% of completers are women). You can find out more about what we have learnt from running the AuthorAID MOOCs in our 2017 paper published in Open Praxis “A MOOC approach for training researchers in developing countries”. We also presented a webinar on the topic which was hosted by eMerge Africa – available to watch online here.